100% of proceeds go to PROTECT and the National Association to Protect Children – the army fighting what Andrew Vachss calls “the only holy war worthy of the name,” the protection of children. The Protectors Anthologies have raised over $5,000 for their cause. We’ve rallied a platoon of crime, western, thriller, fantasy, noir, horror and transgressive authors to support PROTECT’s important work: lobbying for legislation that protects children from physical, sexual, and emotional abuse. 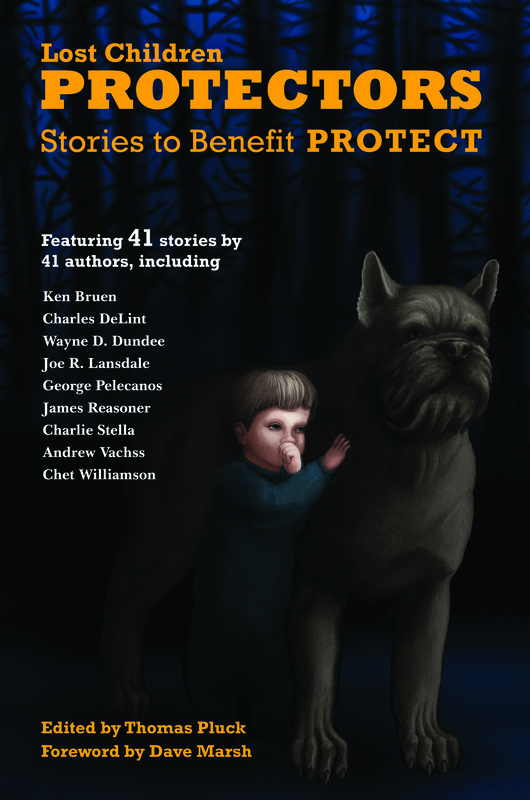 Protectors includes the exclusive three opening chapters to Ken Bruen’s upcoming novel Spectre in the Galway Wind, plus powerful stories from George Pelecanos, Andrew Vachss, Joe R. Lansdale, Charles de Lint, Chet Williamson, James Reasoner, Charlie Stella, Michael A. Black, Wayne Dundee, Roxane Gay, Ray Banks, Tony Black, Les Edgerton and 27 more, and 100% of the proceeds go to PROTECT. Among PROTECT’s victories are the Protect Our Children Act of 2008, which mandated that the Justice Department change course and design a new national nerve center for law enforcement to wage a war on child exploitation, the Hero to Hero program, which employs disabled veterans in the battle against child abuse, and Alicia’s Law. PROTECTORS includes a foreword by rock critic Dave Marsh, and fiction by Patti Abbott, Ian Ayris, Ray Banks, Nigel Bird, Michael A. Black, Tony Black, R. Thomas Brown, Ken Bruen, Bill Cameron, Jen Conley, Charles de Lint, Wayne D. Dundee, Chad Eagleton, Les Edgerton, Andrew Fader, Matthew C. Funk, Roxane Gay, Edward A. Grainger, Glenn G. Gray, Jane Hammons, Amber Keller, Joe R. Lansdale, Frank Larnerd, Gary Lovisi, Mike Miner, Zak Mucha, Dan O’Shea, George Pelecanos, Thomas Pluck, Richard Prosch, Keith Rawson, James Reasoner, Todd Robinson, Johnny Shaw, Gerald So, Josh Stallings, Charlie Stella, Andrew Vachss, Steve Weddle, Dave White, and Chet Williamson. Cover art by Kim Parkhurst. Interior design by Jaye Manus. Cover design by Sarah Bennett Pluck. Print design by Suzanne Dell’Orto. Edited by Thomas Pluck.